The promise of a mass-produced flying car has taunted aviation enthusiasts for generations, Bloomberg Pursuits magazine will report in its Holiday 2014 issue. However, Dietrich is today closer than anyone since pilot Moulton Taylor’s ill-fated attempt to make the US Federal Aviation Administration (FAA)–approved Aerocar in the 1950s. “What Carl and his team are doing is a re-creation of that same dream, with another lifetime’s worth of technology, computing, crashworthiness and aerodynamic modelling,” said Jake Schultz, a technical analyst at Boeing Co and author of A Drive in the Clouds: The Story of the Aerocar. More than a hundred people have paid deposits of US$10,000 (RM33,800) each for the Transition, which will be capable of 70 miles (110km) per hour on the road, and 100mph in the sky when it finally comes to market within the next three years. Dietrich is refining details on the third-generation prototype of his US$279,000 vehicle before attempting certification by both the FAA, which regulates planes, and the National Highway Traffic Safety Administration, which oversees cars. A year after that triumphant flight in Oshkosh, Dietrich, 37, sits in his sparsely decorated office at Terrafugia’s modest headquarters behind a Best Western in Woburn, Massachusetts. He said he first proposed a flying car as a doctoral candidate in aeronautical engineering at the nearby Massachusetts Institute of Technology, where he partnered with a pair of Sloan School of Management students and two other engineers (including the woman who’s now his wife) to win second place in the 2006 MIT US$100K Entrepreneurship Competition. That same year, Dietrich also won a US$30,000 Lemelson-MIT National Collegiate Student Prize, part of which he put toward that initial trip to Oshkosh, where he met his first angel investors and even signed up prospective buyers. One reason the Transition is further along than any previous flying-car concept is that, in 2004, the FAA created the so-called light sport aircraft designation for planes that weigh less than 1,320lbs (600kg) and seat no more than two people. 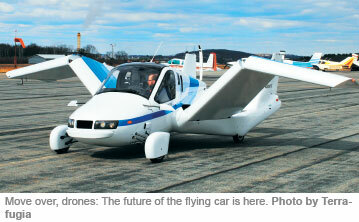 Critics say flying cars are unlikely to be both great airplanes and great automobiles. But that misses the point, said Dietrich, who explained the Transition is intended to expand the definition of an airplane, solving a number of persistent problems in the process. First, small planes are virtually useless in inclement weather. If a storm rolls in while you’re flying the Transition, on the other hand, you can simply land at many of the 5,000-plus airports in the US alone, push a button to fold up the wings and hit the road until conditions improve. At home, you can park it on the street or in the typical suburban garage. And it runs on regular unleaded petrol, which is cheaper and cleaner than aviation fuel and available at your local service station. “You’re getting comparable mileage to your road car, but you’re going 100mph over all the traffic,” Dietrich said.